My birthday was always the coldest day of the year. If not literally true, it was family legend, and everyone knows that myth is much stronger than meteorology, even in the north country, where the snow lies deep on the mountaintops, and houses are built to keep the heat in, not out. This particular legend had its origin—reasonably enough—on the date of my birth, January 11, 1952. My family lived in Flagstaff, but the family doctor had been having a difference of opinion with the hospital board, and had moved his practice to the Williams Hospital. So, when my mother went into labor early in the morning, my twenty-one-year-old parents were obliged to drive thirty miles over a two-lane ice-slick road, through the teeth of a driving blizzard, in order to get to the doctor. When I was finally born, just at dark, my father was so unnerved by the entire experience that he went out to a nearby restaurant and ordered ham and eggs for dinner—forgetting that it was Friday. (Way back when, Catholics didn’t eat meat on Fridays.) Driving the thirty miles home through snow and black ice, he ran off the road twice, got stuck in the drifts, and—as he later recounted—managed to free himself only because he couldn’t stand the thought of freezing to death and leaving my mother with a one-day-old child. At the age of two days, I too made the perilous trip through the dark pines of the frozen landscape, to become a third-generation native of Flagstaff. There aren’t a lot of us, if only because Flagstaff isn’t that old. Among the early founders of the town were my great-grandparents. Stanley Sykes was born in Yorkshire, England, but at the age of fifteen, was diagnosed with consumption. The only chance, his doctor told him, was to leave England; go to Arizona, where the warm, dry air was good for the lungs (well, it was 1868, after all; the midwesterners hadn’t got here with their damn mulberries and bermuda grass yet). Stanley heeded this advice, and with his elder brother Godfrey, set sail for the New World and the healing balm of the desert air. Like many another outlander—my husband, for example—who thought Arizona was a desert, Stanley was startled to find that the northern third of the state sits atop the Colorado Plateau, and that the San Francisco Peaks are covered with the largest forest of Ponderosa Pine in the world. In search of desert, Godfrey went south… but Stanley stayed, seduced by the rush of wind through the pines and the clear dark skies of the mountain nights, thick with stars. Great-grandmother Beatrice Belle Switzer came from Kentucky, along with her seven brothers and sisters, when the family farm was flooded out. It must have been a flood of biblical proportions, because once the Switzers started moving, they didn’t stop until they came to Flagstaff, which—at 7000 feet—they evidently considered high enough ground to be safe. The air in Flagstaff may not have been hot, but apparently it was dry enough, since Stanley lived to be 92, finally dying on a vacation to San Diego (that fog will get you every time). I was four when he died, and still have a vivid memory of him in his armchair, the smoke from his pipe drifting in the lamplight, as he taught me the delicate art of building houses out of cards—a skill that’s stood me in good stead since. His son, Harold—my grandfather—became the mayor of Flagstaff—and thereby hangs another family tale. It was a scandal, in fact—or so everyone said—when my mother, Jacqueline Sykes, the mayor’s daughter, descendant of one of the First Families of Flagstaff, fell in love with Antonio Gabaldon. Tony was smart, handsome, athletic, hardworking—and a Mexican-American, born in Belen, New Mexico. In 1949, in a small Arizona town, this was miscegenation—or so everyone said. My mother’s friends said so. Mrs. X, her English teacher, said so, telling her firmly that she couldn’t possibly marry a Mexican; her children would be idiots. The parish priest who refused to marry them said so; such a marriage would never last. The “interested parties” who took out a public petition against the match said so; it was a scandal. Her parents said so—and at last she was persuaded, and reluctantly broke the engagement. He drove down from the snow-covered mountain to the desert and brought her back the same night—and they were married at 6:30 the next morning, by a priest from another parish. It was a long and happy marriage—dissolved only by death—and thirteen months after the wedding, I arrived, the third generation born on the mountain. We (and the fourth generation) live in Scottsdale, but I still keep the family house in Flagstaff, and escape there regularly to write; to me, the ideal weather for writing involves a gleaming portcullis of icicles to keep out all intruders, soft white drifts on the pines and the sidewalks, and the muffled grind of cars in the distance, crushing cinders into the slippery packed snow as they labor uphill. No salt on these roads; the San Francisco peaks are in fact one mountain, the remains of an extinct volcano—or least we hope it is extinct; the U.S. Geological Survey is not so sure. It’s 72 on this Christmas Day, and the dogs are swimming in the pool. My husband gives me warm slippers, though, knowing I’ll need them soon. My birthday, after all, is always the coldest day of the year. 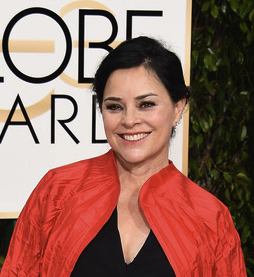 Top image: Arriving on the Red Carpet at Golden Globe Awards in Beverly Hills on January 10, 2016. (Getty Image). 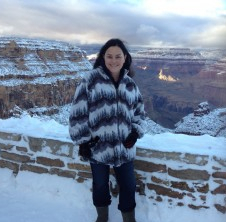 Second image: At the Grand Canyon in 2012. (Photo by my husband.) 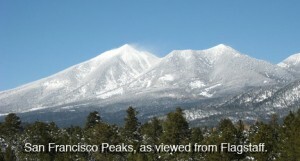 Image of the San Francisco Peaks is from summit.org. 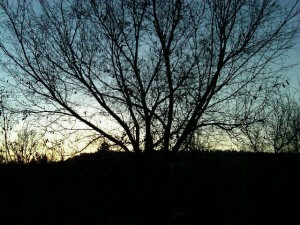 Lower image: 2012 winter view from a household deck in Flagstaff, Arizona. (Photo by me.) This page is also located under the "About Diana" menu. I love living in Flagstaff. I am not a native…bought my house here in 2009. Last week we had 31 inches of snow…it is beautiful. When I discovered your books back in the 90s I would never have predicted I would end up living in your hometown. I am happier here than I have ever been. Happy Birthday! Many more, God willing. As a woman of Puerto Rican-Irish (and a bit of Scottish) heritage, I proudly salute another Hispanic/British Isles woman! I have noted with great pleasure the success of the combination in Joan Baez and Linda Ronstadt, and then I discovered your writing. Suffice it to say I now own all of the Outlander novels and shorter pieces (and both Companions), and I have read them all through 3 times. Thank you for the many hours of enlightenment and enthralled emotion! Vivan las Razas! thank you for sharing. We lived in AZ for a short time and loved Flagstaff. 36 years ago when my husband and I wanted to marry we experienced much the same as your parents did. That was awesome. I loved learning about your own family tree. And Mrs. X was very wrong. Thanks for reposting this. Lovely to hear about your family history, I can feel the cold from here! I’d always thought a lot of your novels’ contents was from real events / people – I see I was right. My own family went to Canada in 1957 but unfortunately didn’t stay and returned to the UK in 1971. Reading this makes me wish (so much) that we’d stayed. I just wanted to wish you a very Happy Birthday! Simply, I love your books, I hope you had a fantastic day, and that you got to do something you really enjoyed! Thank you for writing!! Hey! We share a birthday! Growing up in Kalgoorlie, Western Australia though (which is pretty much on the southern edge of the desert), January 11 was often among the hottest days, and regularly reached over40 degrees celcius. My parents also had a similarly fun time that day. They were living in rural Victoria (south-east of Australia), and spent an hour and a half making a mad dash to the hospital, right in the middle of a rather hot summer day. They made it to hospital with minutes to spare, and I was born at 6 minutes past midnight. I think my favourite part of the story was on the way to the hospital, my dad was racing down narrow country lanes, mum was screaming her head off in labour. At one point he flew past a trailer-van on the side of the road selling hot food to blokes on the way back from the mines. Just as they went past, mum gave a particularly loud bellow out the open windown (because, summer. No air-con in those days), much to the astonishment of the men standing around the food van. Heaven knows what they thought my father was doing that day, racing at top speed though Victoria, with a screaming woman on the back seat! Loved reading about your family! I too come from a mixed family and when my parents got married there were people who said some very similar words to my parents, and they too are wrong. Happy Belated Birthday! This was a fascinating look into your history! I hope you had an enjoyable birthday. Mrs. X was most definitely wrong! My daughter Farida and I met you twice in Fergus, Ontario, at Scotish Festival and Highland Games. responses to your postings before. Your beautiful family saga inspired me to share my story with you. daughter’s surgery to conclude. It’s the first of at least two lifesaving surgeries and I’m very worried. To keep my mind occupied with something else, I decided to type a brief story of my adul life. different not only in Arizona, but in Poznan, Poland where I was born and raised. When I first met my husband, Shafi, I couldn’t possibly know how complicated our life would become. We didn’t realize how many obstacles we would have to overcome. I was from a good old Catholic family, and he was a foreigner from Afghanistan, and a Muslim! My parents didn’t object our marriage ( at least I didn’t hear it) saying that they trusted my judgment. Neither did Shafi’s parents! But most of my family was furies and very vocal about their outrage. that he wasn’t already married back home and that his government allowed him to get married abroad. in Afghanistan and confirmed by the Afghan Ambassy in Warsaw. persistence and gave us the green light to get married. The wedding ceremony and reception were small but lovely. Actually my husband had to go back and it was my choice to go there with him. We already had a little child, our daughter Farida, who went with us. Even though I read a lot about Afghanistan and learned the language well, landing there was like stepping through the stones and finding yourself not only in an absolutely different place, but also different time. It was a real time travel for me and I was an Outlander there. liked and I reciprocated the feelings. or if we would see each other again, was the most difficult decision I’ vet ever made. for my husband to take me to the hospital where I gave birth to a healthy boy, Andrew. We started building our life in Poland again. After three years we welcomed ours third child, son, Jamil Jacek. It wasn’t the end of our Odyssey though. Circumstances pressed us to pull up stakes again. From the first intake of Canadian air , we all felt that we’d finally found home! be prejudged base on differences, and our species finally gets it that we are one! went well and she’s in the recovery room. I just have to wait a little longer to see her. Being so stressed out I misspelled my name! is almost always mispronounced in a way that makes me upset. Today, being in the hospital I’m using my iPad, not the laptop I’d always used, that’s why my full name showed up on to of my long text. That wasn’t my intention, just me being electronically challenged. Lovely story, Iwona. Your love story sounds like it could be made to be a movie! My thoughts are with you for your daughter, hope all is well and your worry lessens. Love that Outlander can take our minds from our worries for a little while. Thank you very much for your kind response and moral support. I appreciate it very much!! ” I wona “cry when I hear it mispronounced. Ilona, your story is inspirational ☺ Im so glad you chose Canada! Also very happy for you , that your daughters surgery went so well. Thank you very much for your response and emotional support. story Ilona instead of Ivona. I enjoyed your story very much, thank you for Sharing! Diana, first, I can’t believe you are ten years older than I – I always thought you were younger. Second, the story about your parents is amazing. Glad they stuck to their own feelings. I, too, am from Kentucky, and there is a quaint covered bridge just to the NE of Frankfort called “The Switzer Covered Bridge”. I wonder if your family came from this area? I tried to paste a picture of it in this note but could not. If you are at all interested in seeing it, Google “Switzer Frankfort Ky. It is a beautiful sight. I inherited the first 6 books from my 96 year old mother-in-law, also from KY, and finally understood just why she loved them so much. She emailed you several years ago asking you to hurry up and publish your next book, “An Echo in the Bone”, I believe, since she was getting on in years and didn’t want to miss it! She was a character! Thank you for sharing your talent with the world, and I am anxiously awaiting the next chapter. This story warms the heart, thank you for sharing. Is there nothing about you that is not interesting?! Such a beautiful love story about your parents. Your mom knew what she wanted and she was going to have it, societal objections be damned. It’s easy to see where you get your strong independence from. And what a brilliant family history you have! My family also founded one town and a section of another in the state I live in, but those places are not near as nice Flagstaff so I’ll not divulge their locations. Thank you so much for sharing this with us. I am one of those people who subscribe to the belief that famous people are entitled to their private lives, and being a fan does not automatically entitle me to nose around in it. But I do admit, I love learning these little things about my all-time favorite author. And again, thank you for sharing. I enjoyed reading this, thanks for sharing. Love is love what ever peoples backgrounds may be right? Hope you had a lovely birthday (warm or cold) Lovely pictures too! So you come from a long line of strong, determined women, as do I. My heritage is English, Scottish and American Indian (Cherokee) although my brother got all the beautiful olive skin and jet black hair. I’m the pale faced, blue eyed one. Go figure. Three of my friends and my step-mom (my diamond in the rough) are greatly anticipating your ninth Outlander book and counting down the days to April when the 2nd series begins. While being prepped for my colonoscopy,even my anesthesiologist and I were discussing your books. What a lovely discussion we were having when I suddenly went dark. LOL. When I awoke, I just picked up where I recall leaving off and we both laughed about it. You’ve a gift and we get to enjoy your gift. I think the reason is the actual historical events which make the words jump off the page and take us to our happy place. Thanks so much – truly. I loved reading Diana’s story of her parents’ love for each other. Iwona’s story was great, too. My husband and I had some tough times, too, with negativity from both sides of the family. My husband was a resident in general surgery at a hospital in New York City. He had come from the Philippines to learn more and specialize in pediatric surgery. He could not practice medicine in the Philippines because he is 100% Chinese, his parents coming from China when they were children. I was working at the same hospital while trying to get a teacher’s license. I got sick and was admitted to the hospital where I met the young Chinese Filipino doctor. My maternal grandparents came from Wales in the early 1900′s. My father’s grandparents came from Ireland. My parents faced discrimination because of their religious difference. Also, she was Republican, and he was Democrat. I figured I had been brought up in a mixed home, so I was shocked when they got upset about my desire to marry Dr. Tan. His parents were adamant that he needed to marry an Asian woman. We married anyway and found out later that in 1965 it was still illegal for people of different races to cohabit in Florida. It’s never been an issue, but I guess we could get a quickie divorce if need be because our marriage was illegal at the time.. After 50 years, it’s not going to happen. We have two brilliant children, Cecilia Tan, a writer, and Julian Tan, a drug company marketer and researcher. Our lives have been enriched by living in several different cultural environments. We love to travel and a few years ago went to China with our grown children to see where his side of the family originated from. Now we need to do a trip all over the UK to explore my family’s roots. Happy Birthday Diana – you are one year and 16 days older than me (not close really, but oh well…:-)) From the photos, you are looking so well and happy, so my best wishes for this to continue for many years to come.